View More In Garden Furnishings. Get everything you need to know to build 25 outdoor projects, from benches to birdbaths! 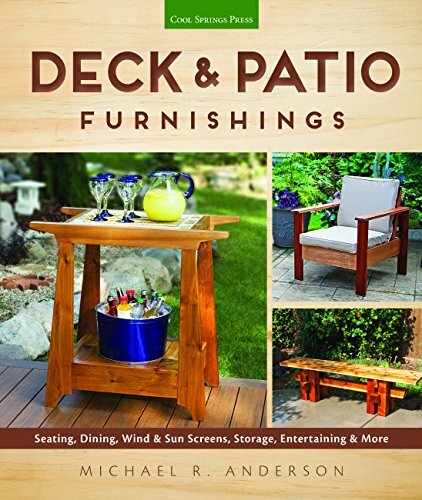 Deck & Patio Furnishings is a collection of easy to intermediate projects that any homeowner with basic tools can build. These practical projects for outdoor living range from seats, benches, tables, and lounges to overhead arbors, wind and sun screens, deck boxes, storage, bars, and even side tables and cooler stands. Most are made with standard dimensional lumber, so finding the right materials will be a snap! Each of the 25 original, never-before-published projects includes dimensioned plan drawings, cutting and shopping lists, complete step-by-step instructions with clear how-to photos, and a gorgeous finished photo so you can be sure your work will go smoothly.